To grow your business effectively and sustainably, you need to have an engaged workforce that’s pulling in the right direction. Otherwise, you’ll find yourself trying to steer your business on a course that your employees don’t understand and don’t feel part of. As you pull into the car park you sigh with frustration; there are no parking spaces available. You can feel your stomach starting to churn as you are going to be late for your meeting with the CEO. Slightly breathless, you arrive at reception. There’s nothing to be seen but a vase of drooping flowers. Eventually you hear footsteps. “Can I help you? The receptionist is off sick again”. You are directed upstairs to the second door on your right. You climb the stairs, knock on the door and walk into a broom cupboard! You are sure they said the second door on the right. In an instant you decide to turn on your heel and leave. You pull into the car park to find a space straight in front of you with a sign with your name on it. Reaching the well-lit and warm reception area, you are greeted by a smartly dressed receptionist. Now you are really excited to meet the CEO. Engaged employees understand the strategic direction of the company and are proactive. When employees are disengaged the first example is all too often a reality. So, how can you spot disengagement? 5) They may well let you down when dealing with customers, damaging your brand and degrading your customer service levels. 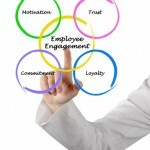 For more information about how to raise your levels of employee engagement, please contact me at lisa@lisabrice.co.uk.